“Reliance upon Allah is from the highest ranks of closeness to Allah.” – Imam al-Ghazali. Drawing on the knowledge and a lifetime experience of Imam al-Ghazali, one of the greatest scholars and saints in history, Shaykh Faraz Rabbani provides the students of this course with the elixir that can transform faith in the oneness of Allah into a firm mountain of confidence and trust in Him. Based on Imam al-Ghazali’s book, Ihya Ulum al-Din, which has been used for a millennium to successfully refine believers to be the best versions of themselves, this course offers timeless, soul-nourishing wisdom, in a practical manner, accessible to all. 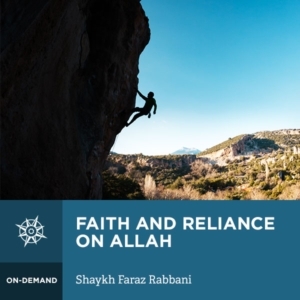 “The lack of reliance upon Allah is a consequence of a lack or certitude in the oneness of Allah, or a heedlessness of what the implications of divine oneness are.” – Shaykh Faraz Rabbani. The slightest of breezes can put out the smallest flicker of a flame, yet the strongest of winds only succeed in strengthening a raging fire. Belief in the Unity of Allah is akin to a seed which has the potential to grow and spread its roots as the mightiest Redwood trees do. The fruit which emerges is an undaunted reliance in Allah, and – more importantly – being beloved to Allah. When a believer realises that Allah alone is in charge of everything, that He alone controls everything, he is able to hand his affair over to Allah. He is able to relax, knowing someone infinitely more capable is taking care of matters for Him. He is able to wholeheartedly rely on Allah. “And whoever relies on Allah completely – He is more than enough for him.” (65:3). This course provides a deep understanding of Tawhid and how it relates to the fact that none can benefit or harm except Allah. From this the proper attitude to facing challenges becomes clear; and the most beneficial approach to dealing with “means,” such as medicine for illness, is also skillfully explained.